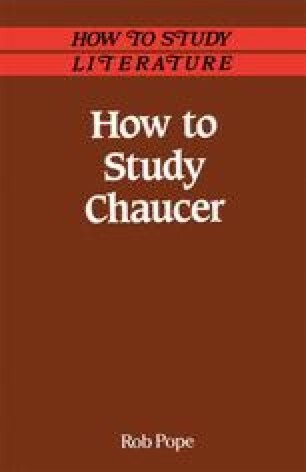 THIS chapter sets out a method for studying any of the Canterbury Tales, and illustrates it with a look at one of the most commonly studied Chaucer texts after The General Prologue, The Knight’s Tale. Even if you are not studying this tale, you should still find the method and insights developed here of direct relevance to your particular tale. To help you make the connections, briefer study frameworks along the same lines are supplied in the next chapter for the most commonly studied Canterbury Tales.